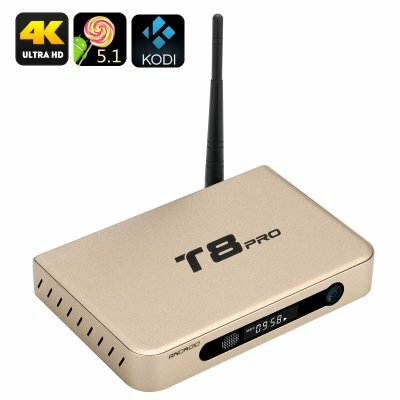 Successfully Added T8 Pro Android TV Box - Quad Core CPU, 2GB RAM, Android 5.1, Kodi 16, 4K Resolutions, 2GB RAM, Airplay, DLNA, 3 USB Ports (Gold) to your Shopping Cart. Don't let the compact size fool you, this T8 Pro Mini TV Box is really powerful with its Amlogic S812 Quad Core processor, Octa Core GPU and 2GB of RAM you get a strong performance meaning you can enjoy a wealth of games and movies, with a sleek metal case to dissipate the heat and side vents for plenty of airflow it won’t suffer from any overheating problems no matter how demanding the tasks are you set it. Kodi Media player V.16 comes preinstalled on this mini Android TV box so you can enjoy an easy to navigate interface that lets you access a wealth of online media as well as navigate locally stored films, photos and music through its remote control friendly GUI. If you want to use a keyboard and mouse you have access to 3 USB ports and there is also Bluetooth support for more connectivity options. With the ability to play 4K files this tv box lets you access all the latest UHD 4K TV and movies from the internet via a network lead or the super fast dual band Wi-Fi Support. With 8GB of onboard storage, that can easily be extend via the micro SD card slot, this HDMI 1080p HD TV box has room for loads of media entertainment so you can enjoy games and videos a plenty. The T8 Pro entertainment hub makes the ideal ready to go Media centre for your living room brining the latest tools and resources along with an Android 5.1 OS so you get all the best of lollipop on your TV. This T8 Pro TV Box comes with a 12 months warranty, brought to you by the leader in electronic devices as well as wholesale Android TV Boxes..